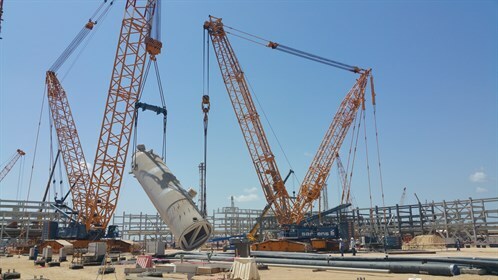 Posted on 2nd March 2018 8th March 2018 by William T.
Sarens was commissioned by Bechtel Overseas Corporation to carry out heavy-load operations on an onshore gas processing terminal project at Idku City (North-East Alexandria). The terminal project, initiated by BP, once completed should allow extracting more than 28 million litres per day (a quarter of the current production in Egypt). The initial contract warded to Sarens was to complete the heavy lifting of 10 Cargo but the major task included lifting of four absorbers weighting around 384MT each. A team of 20 people worked throughout the Ramadam period, adapting to shorter work hours, to successfully lift the four main absorbers at the plant. During the process the team deployed the following equipment: three Liebherr mobile cranes with two LTM 1100 and one LR 1350, two Terex-Demag AC 200 all terrain cranes and one Demag CC4800 crawler crane, two Sany SCC1500 D and SCC1000 crawler cranes and a Grove RT 9130 mobile crane. Arriving from Thailand, the CC4800 in Superlift configuration with 48m main boom served as the main crane supported by LR 1350. It took the Sarens team members nearly 10,000h of work to complete all operations.